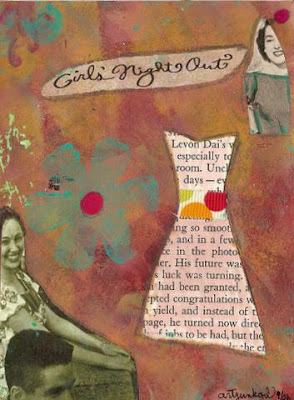 I am not an avid fan of the institution "Girls Night Out." GNO doesn't involve husbands and I rather like those people. I like my own first and foremost, but I probably like yours too and even if I don't he'll probably grow on me in a couple weeks time. On Saturday night a GNO was ordered by a recently single-again friend. She had reserved a nice little bistro on Main Street in Park City. It is against my moral principles to turn down an opportunity to try a new culinary experience and so I replied via e-mail that "this GIRL would be there!" Park City is about two weeks behind the Wasatch Front as it pertains to spring blooming. Lilacs were perfuming the air. A crabapple tree--dotted with white lights--hung over main street and diverted attentions. The moon was a skinny slice of crescent, topped with a shiny planet, swimming in a very dark sky. Needless to say, the town was infused with Romance (capital R). The Bistro was very French looking. We sat at a long table stretched across the interior out to the front porch. Six of us Girls (plus a baby) looked at menus, discussed choices and ordered drinks. Our server came right quick to our table, and opened her night with the lines, "Hello ladies! I am Jules . . . and I am single too!" "Not all of us are single." I responded wishing Chup were here ordering the pomme frits. "Then hold on to him!" exclaimed Jules in my direction. "I will," I smile "there is a lot of him to hold." Newly Single Friend talks about a Pig Party she attended only hours before the official start time of GNO. A Pig Party needed an obvious explanation. As it turns out, it is an event where a pig is roasted on a spit and devoured with drinks and chips. When people of Polynesian descent throw these gigs it is called a Luau. When white guys roast a pig, it is called a Pig Party. Orders are taken, Duck, Duck, Mussels, Salmon, Salmon and Pomme Frits. There is talk of pregnancies, breasts, divorces, salary bargaining, cheating husbands, family planning, sick children who throw up on other people, proper strawberries and ultimately experiences that don't need to be shared on a public blog. Having covered all of these topics in two-and-a-half hours qualified our evening as certifiable, genuine and approved Girls Night Out. I was the only person at the table without cleavage. About the time the I was sharing a dark-chocolate lemon tarte my phone beeped. The text message read, "I miss you." I thought about Chup at home eating Del Taco and playing computer games. Del Taco is so gross. There was talk of dancing after dinner, but we thought better since we had a baby amongst us. Dancing is a good way to work off a dinner inspired by the French though. Instead we strolled a bit more down Main Street. My phone beeped again, "I love you." Suddenly I was ready to leave. It was a bit after 1 in the morning when I arrived home. Though the porch light was on, the house was dark. I washed my face and climbed into bed. "How was your night?" a sleepy-voiced Chup asked. "It was lovely. I am glad I went." "Oh good." Rolling over, Chup gives me an all-encompassing bear hug. "I missed you all night." After that we snuggled until falling asleep. Clearly I've got the best of both worlds. Like a Pig Party and a Luau.